I have added profiles for all the wrestlers on the show, you can click on their names above to go directly to it. Let’s see how much of these matches actually aired. In a not surprising development for GAEA Japan, we start the show with two rookies. There will be many more. Chiharu Nakano had her first match on May 14th so she is slightly less experienced than Meiko Satomura, however Meiko is only 15 years old at the time of the match. Meiko appears to be getting the biggest push of the rookies, giving her an advantage regardless of her age. They tie-up to start, Meiko pushes Chiharu into the ropes but Chiharu pushes her back and hits a dropkick. More dropkicks by Chiharu but Meiko gets up and pushes her, they trade elbows until Meiko knocks Chiharu to the mat. Meiko starts on Chiharu’s arm and goes for the cross armbreaker, but Chiharu blocks it and applies a cross armbreaker of her own. Meiko quickly gets into the ropes, running knee by Chiharu and she hits a scoop slam. She goes for the cross armbreaker again but Meiko reverses it, they go back and forth with cross armbreaker attempts until Meiko gets into the ropes. Irish whip by Chiharu but Meiko elbows her, leg sweep by Chiharu but Meiko gets into the ropes again. Back up, jumping shoulderblocks by Meiko but Chiharu bridges out of the pin. Meiko elbows Chiharu and applies a cross armbreaker takedown in the middle of the ring, and Chiharu quickly submits! Meiko Satomura is your winner. Very short, interesting that both kept going for cross armbreakers but neither really did anything to weaken it up first. Course the cross armbreaker is respected as an insta-death move but still some build-up would be nice. This match was more to put over Meiko Satomura and establish her as the top rookie. More rookies! Chikayo Nagashima would go on to have a long and successful career, she debuted on the first GAEA Japan event and is probably slotted #2 or #3 among the rookies. 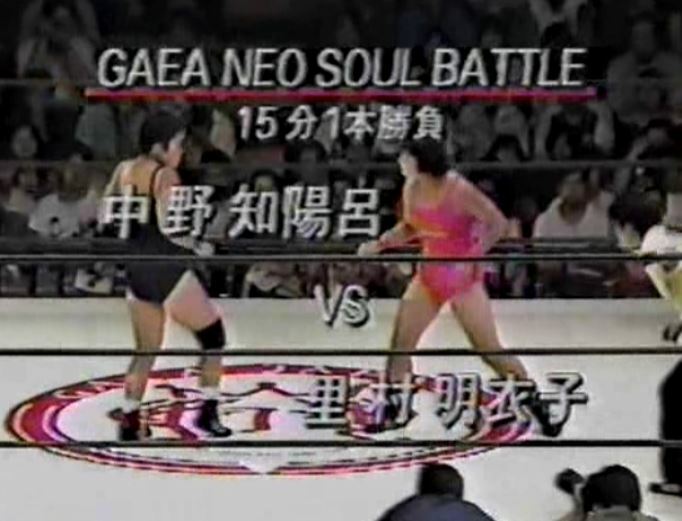 This is Makie Numao’s debut match, she mostly stayed in the midcard during her seven year career before she retired from GAEA Japan in 1999. Makie strikes first in the match as she kicks Chikayo repeatedly, she lets Chikayo get up and goes for another kick, but Chikayo blocks it and hits a fireman’s carry takeover. Chikayo works on Makie’s arm before booting her into the corner, stomps by Chikayo and she takes Makie to the mat again. Side headlock by Chikayo but Makie gets into the ropes, Makie rolls up Chikayo but it gets a two. Irish whip by Makie and she hits a dropkick, scoop slam by Makie and she yanks on Chikayo’s arm. Armdrags by Makie and she twists on Chikayo’s arm, but Chikayo gets a foot on the ropes. Makie elbows Chikayo in the arm and hits a scoop slam, Irish whip by Makie but Chikayo hits a jumping crossbody. Chikayo applies a kneelock, she picks up Makie but Makie applies an inside cradle for two. Big boot by Chikayo and she hits a scoop slam, rolling pushes by Chikayo and she slaps Makie in the face. Makie kicks Chikayo in the back and in the leg, more kicks by Makie but Chikayo boots her in the head. Chikayo goes for a monkey flip but Makie pushes her off, Chikayo cradles Makie and she gets the three count! Chikayo Nagashima wins. This was clipped in half so hard to get a good feel for it, but I liked that Makie brings something a bit different to the table. That being lots of kicks. Chikayo looked solid too but this was mostly designed to show off the new rookie which I think they did a reasonably good job of doing. Too cut up to recommend but a good display by both. JWP Invasion! Tomoko and Tomori both hail from JWP and debuted in late 1994. Tomori is a literal unknown, I couldn’t find much information on her and she didn’t wrestle for very long, but you all know Tomoko Miyaguchi as she later changed her wrestling name to Ran Yu-Yu. On the GAEA Japan side are two rookies, so we have now seen eight rookies on this show. It does hurt the match structure some, but they all have a lot of fire and passion. Toshie and Sonoko attack before the match starts as all four brawl in the ring, Tomoko and Tomori gain the advantage for a moment but GAEA Japan takes back over. Dropkicks by Tomori and Tomoko and Tomori hits two belly bumps on Toshie for a two count. Toshie stomps on Tomori and tags Sonoko, Sonoko works on Tomori’s leg but Tomori gets into the ropes. Tomori gets away and tags in Tomoko, shoulderblocks by Tomoko to Sonoko and she hits a scoop slam. Sonoko puts Tomoko in a leg lock but Tomoko inches to the ropes to force the break, Sonoko picks up Tomoko and she delivers a trio of dropkicks. Sonoko picks up Tomoko and hits a scoop slam but Tomoko hits a jumping crossbody, Tomori goes up top and hits an elbow onto Sonoko’s arm. Tomori hits two Bubba Bombs on Sonoko, Toshie comes in but Tomori fights off both of them. Sonoko dropkicks Tomori and makes the tag to Toshie, Toshie dropkicks everyone and hits a back elbow onto Tomori for a two count. Toshie tags Sonoko back in but Tomori boots Sonoko in the head, Tomoko tries to kick Sonoko also but Sonoko blocks it. Leg drop by Sonoko and she hits a springboard bulldog out of the corner., cover by Sonoko but Tomoko bridges out of it. Sonoko picks up Tomoko as Toshie goes up top and hits a diving crossbody onto Tomoko, Sonoko comes into help but she hits a missile dropkick on her own partner by accident. Missile dropkick by Tomoko to Toshie, Tomori then hits a diving body press and Tomoko covers Toshie for two. Tomoko hits a pair of jumping kicks to Toshie’s chest, she picks up Toshie and delivers the Airplane Spin Samoan Drop. Cover by Tomoko, and she gets the three count! Tomoko Miyaguchi and Tomori Kobayashi are the winners. This one was clipped even further, as only 7 minutes of the 20 minutes was shown. I won’t be “that guy” and say I could tell that Tomoko would be a future star, as honestly it was Tomori that impressed more, at least with how they clipped it anyway. It was chaotic with no real selling, which either was because they were all excitable rookies or because they clipped out the slower parts. Anyway, solid fast paced rookie action but not enough was shown to really rate. We have left the Rookie Phase of the card, as the last two matches only have veterans. Bomber Hikari started back in 1987 but retired a couple years later due to injuries. She didn’t wrestle again until re-joining GAEA Japan when it formed, but she would retire again due to injuries in 1997. KAORU still wrestles to this day, at the time of the match she was an eight year veteran but still mostly a mid-carder with minimal title success up to this point. This match is joined in progress as Bomber stomps on KAORU, but KAORU rolls up Bomber and gives her some stomps of her own. KAORU puts Bomber in a single leg crab hold but Bomber crawls to the ropes and reaches them to force a break. KAORU tosses Bomber out of the ring and goes out with her, KAORU tosses Bomber into the guard rail and then into the chairs at ringside. KAORU returns to the ring and waits for Bomber, Bomber returns with a chair but KAORU hits Bomber with her own chair and hits a jumping double chop. Crossbody by KAORU, but it only gets a two count. KAORU puts Bomber in a surfboard before letting her go, Irish whip by KAORU but Bomber catches her with a powerslam. Bomber gets KAORU on her shoulders and gives her the Airplane Spin, which impacts both of the wrestlers equally. KAORU recovers first and headbutts Bomber, Bomber gets on the second turnbuckle but KAORU recovers and boots Bomber out of the ring. KAORU goes up top as Bomber gets back on the apron, KAORU dropkicks Bomber out of the ring but Bomber moves when KAORU goes to jump down onto her. Bomber gives off the ropes and dives out onto KAORU with a plancha suicida, Bomber charges KAORU again but KAORU gets back into the ring with a slingshot sunset flip. Bomber picks up KAORU but KAORU reverses the powerbomb attempt, Bomber goes for another one but KAORU rolls her up for two. Bomber goes up top but KAORU avoids the diving headbutt, KAORU gets on the apron and she delivers a swandive dropkick. Release backdrop suplex by KAORU, she picks up Bomber and hits a second one and covers her for two. KAORU picks up Bomber and hits a Tornado DDT, but Bomber barely kicks out of the pin. KAORU slaps Bomber but Bomber slaps her back, brainbuster by KAORU and she nails a springboard moonsault for the three count! KAORU wins the match. For the second straight show, we get a big Nagayo singles match in the main event. Chigusa Nagayo is of course the main heroine of GAEA Japan, defending the promotion against all invaders. Bad Nurse Nakamura hails from FMW, she debuted for the promotion in 1990 but was generally behind several other FMW female wrestlers in the pecking order so this was Nagayo working her way up to the bigger wrestlers (namely Shark Tsuchiya and Combat Toyoda). Still, Nakamura enjoys using weapons and won’t go down easy, plus Shark is down at ringside to help if needed. Nagayo talks on the mic before the match while Nakamura plays with her wooden spike, which turned out to be a horrible idea on her part as Nakamura attacks Nagayo and knocks her out of the ring. Once on the floor, Nakamura and Shark both attack Nagayo, as Nakamura uses her spike to cut open Nagayo. Nakamura waits back in the ring while Nagayo bleeds, she finally recovers and gets back in the ring but is immediately hit again by Nakamura. Nakamura drives the spike into Nagayo’s head, Shark hands her a chain and Nakamura chokes Nagayo with it while biting her head. Shark helps with choking Nagayo but Nagayo finally gets away from their grasp and takes the chain. Nagayo whips the chain around while Nakamura avoids it, Nakamura manages to grab the other end of the chain and they get into a tug of war over it. Nakamura kicks Nagayo in the head until she lets go, Nakamura wraps the chain around Nagayo’s neck and leads her around ringside with it. Nagayo gets away from Nakamura, Nakamura returns to the ring and gets a giant pole and hits Nagayo with it as she goes through the ropes. Nagayo grabs the pole and delivers a high kick to Nakamura’s head, she chases Nakamura with the pole before chucking it deep into the crowd so that no one can use it again. Which seems incredibly dangerous. Nakamura gets another stick anyway and hits Nagayo with it as she gets into the ring, Shark comes in to help but the referee gets her out. Nagayo takes away the stick and hits Shark with it, but Nakamura bails out of the ring and runs up into the bleachers. Nakamura chases her down and hits her with it repeatedly, but we clip ahead in the video to Nagayo outside the ring and talking to Nakamura on the microphone. The crowd is cheering, but I won’t pretend to understand what she is saying as she throws that stick into the crowd as well. Nagayo returns to the ring as Shark hands Nakamura another big stick, but Nakamura tosses it out of the ring. Shark argues with her (I will assume that on the microphone, Nagayo was challenging Nakamura to fight her without weapons), she tries to get Nakamura to take it back but she won’t. Nagayo gets on the mat in a wrestling position, Nakamura applies a headlock as Nagayo struggles. Side headlock takedown by Nakamura, Nagayo gets out of it but Nakamura hits a German suplex. Cradle by Nakamura, but Nagayo gets a shoulder up. Nakamura gets on the second turnbuckle and hits a missile dropkick, but Nagayo fires back with a lariat. Face crusher by Nakamura, she goes up top but Nagayo kicks her in the head before she can jump off. Another high kick by Nagayo sends Nakamura back to the mat, Nagayo elbows Nakamura in the back of the head before kicking her in the head again. Headbutt by Nagayo, she picks up Nakamura and plants her with a Running Pirates (a Running Three variation). Cover by Nagayo, and she gets the three count! Chigusa Nagayo wins the match. Due mostly to all the clipping, this is probably the worst GAEA Japan event I have reviewed thus far. Squeezing five matches onto a one hour show (which also had interviews, commercials, etc.) is hard, and these were long matches that were being clipped so a good percentage was missing. Plus the show had eight rookies, and while a lot of them show promise, they are still learning. I liked what they were going for in the main event and I love a good chaotic brawl, it was just more story than substance. Overall a skippable show from GAEA Japan.